Welcome to Whitehall Garden Centres Blog. We aim to provide you with hints, tips, information and advice on all aspects of gardening! It is a chance for you to ask us questions and to read our blog posts about what you should be doing in your garden each month. Summer fruiting Raspberries should be ready to harvest around now. 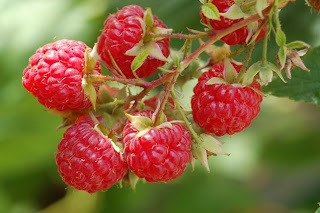 If you have plenty of Raspberries they are suitable to freeze or to cook gently and make a puree .Old canes will be easily identifiable as they will be a darker brown and the remains of fruit clusters and leaves will most likely look a bit tatty. Younger canes will still have fresh summer foliage on and the stems will be green. You can start by untying the old canes from their wire supports and cut them to ground level. You can them tie in new canes, with spacing of around 10cm apart. Make sure you only tie in strong and healthy canes. The old canes which have been pruned out can be shredded and used as mulch.